School zone pedestrian safety c. 1957. Want to join me in urging the village council to improve the crosswalks in front of the Bluffton High School? I’ve been all “het up” about pedestrian safety at the corner of Main St. and College in our little town of Bluffton. Turns out that things you take for granted–like traffic lights and stop signs–are subject to the complex rules and regulations of MUTCD (mutt-kid? 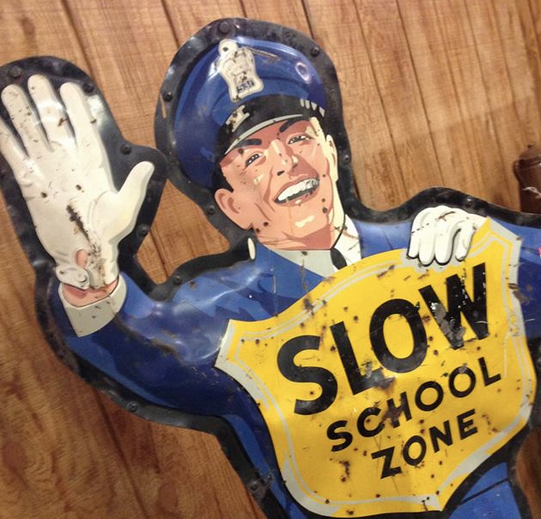 ), our nation’s Manual on Uniform Traffic Control Devices. I’ve talked with the schools, the village, the police department and the state. I’ve been encouraged by a dozen or so parents and grandparents who have kids attending the Bluffton schools near this intersection. All that talk has spun me around in circles a few times, trying to find out what can and can’t be done for pedestrians in Bluffton. It would be so nice if we could force drivers to stop for pedestrians by putting up a control device like a stop sign or traffic signal. Can’t be done. We don’t have enough traffic to warrant one. And in fact, it turns out that there have been fewer rear end collisions at this intersection since we lost our traffic light, which is the goal of MUTCD regulations. At the same time, however, this location has become a hostile zone for pedestrians. Drivers on Main no longer have to slow down for a signal, so they don’t slow down. Most aren’t looking out for kids after school or for other folks trying to get to the library across the street. Well, “hostile” is a strong word. It’s certainly a discourtesy zone. I feel invisible when I’m trying to cross the road and that’s scary. When my family moved to Bluffton some fifteen years ago, we were told that everything was a “a little bit better” in Bluffton. I’d like to see this hold true with our pedestrian safety problem. If a light does not meet MUTCD rules, then what does? What would make the situation even a little bit better? Repainting the stripes more often? Installing signs telling drivers state law requires them to stop for pedestrians? These can be located in-street or above street. Encouraging each other to be more courteous behind the wheel? This last point is certainly the most challenging. Our local officials really want to get something done. In our conversations, I’ve heard their frustration. How do you buck the trend of decreased pedestrian safety that is seen in small towns and big cities across the country? And yes, it is Ohio law that you have to stop for pedestrians in crosswalks. You should be on the lookout for pedestrians and–when it can be done safely–stop to let them cross. Sadly, my research shows that pedestrian safety is addressed when someone gets hurt or killed. I just don’t want to wait for that to happen here. Please join me at the Monday, July 6 streets and alleys committee meeting, which will be held at 7 p.m. on the third floor of Bluffton Town Hall. Help me gather 100 adults and 100 students to make it clear that the current conditions at College and Main are not acceptable. This is Bluffton. I know we can do better.